While I certainly enjoyed putting together that earlier massive list of my favorite films of the 2000s, I have to admit that this substantially shorter list was exponentially more fun. Writing this piece really brought back a lot of wonderful memories, reminding me why I fell in love with Hong Kong cinema in the first place.While my viewing preferences may have leaned towards martial arts films or John Woo-style guns-a-blazin’ Heroic Bloodshed flicks in the beginning, it wasn’t really kung fu or gunplay that sustained my interest. What I really loved and continue to love about Hong Kong cinema from this decade is that each film always seemed to be brimming with potential. Sure, I’ve seen my fair share of “just okay” and even downright terrible HK movies during the 90s, but more often than not, viewing a Hong Kong film felt like a real discovery. Drinking is cool! It makes you invincible! Drunken Master II is another choice of mine that is just as equally deserving of the top spot. In fact, I think it’s probably one of the best martial arts films ever made. This just goes to show what an inexact science these kinds off lists are. Drunken Master II is perhaps Jackie Chan’s finest film, if not the best kung fu movie ever put on celluloid. It has some of Jackie’s best stunts, mixing original director Lau Kar-Leung’s old school choreography with Jackie Chan’s contemporary kung fu comedy shtick. A word of warning: don’t analyze the plot too closely (Oh Andy Lau, where art thou? ), and you’ll be just fine. Just sit back and enjoy the fireworks. Chan’s last stand against the amazing leg-fighter Ken Lo is probably one of the best ending battles in cinema history. Really. What some of you may not know is that this movie actually had a troubled production. Shaw Brothers legend Lau Kar-Leung was the film’s original director, but when Jackie Chan screened the film for the Hong Kong Stuntman’s Union, he realized that Drunken Master II had some problems — namely, it was a little too old-fashioned for modern sensibilities. 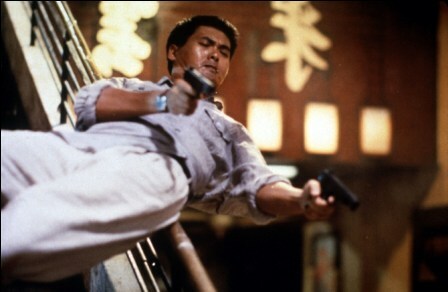 According to Chan, he offered Lau Kar-Leung the chance to make changes, and when he wouldn’t comply, Chan himself had to step into the director’s chair and rework the ending fight. Although I’ve not heard Lau’s side of the story, Chan claims that he would have kept all this under his hat, but it was Lau who complained publicly, announcing that he’d do a REAL drunken kung fu movie. However, the resultant film — the misleadingly titled Drunken Master III – was a complete disaster and a real embarrassment for Lau Kar-Leung. Comrades, Almost a Love Story is my favorite Hong Kong romance of all-time. * I love this movie more than Needing You, Chungking Express, and In the Mood for Love, and I’m extremely fond of all three. This Peter Chan-directed film garnered numerous prizes at the 16th Annual Hong Kong Film Awards, and with good reason, it’s a wonderful film. Comrades tells the story of Xiao-Jun, a dopey, goodhearted Mainland Chinese immigrant played by Leon Lai, who arrives in Hong Kong looking to make a few bucks to send back home as well as save up for his eventual wedding to his hometown sweetheart (Kristy Yeung). As fate would have it, our hero befriends a tough, street savvy “local” girl named Chiao (Maggie Cheung). The two make an unlikely pair; they certainly don’t seem all that compatible on the surface, but as you might expect, sparks start to fly. What happens next is a decade long “romance” that takes us from the streets of Hong Kong all the way to New York City. Who doesn’t love that bicycle scene? Or the way that Teresa Teng’s music is deftly interwoven into the fabric of the story as a kind of thematic parallel? This is, by far, my favorite Maggie Cheung performance of all-time, and this movie definitely made me see Leon Lai in a completely different light. The most surprising performance in the film is Eric Tsang’s; he is flat-out is great in this movie. Tsang’s role as Maggie Cheung’s possible love interest may seem absurd on paper (see Wo Hu for a similar Eric Tsang romance that stretches the limits of believability), but he really makes it work. Initially, you think his character is going to be just another menacing gangster cliche, but Tsang (and the scriptwriters, one assumes) give the character a wise, “seen-it-all” maturity that makes him incredibly endearing, even if you’re rooting for a Chiao/Xiao-Jun romance to take flight. His “exit” from the from the movie isn’t just a case of removing a second suitor from the proceedings — you actually care what happens to him and mourn his loss. Speaking of heartbreaking, how about Kristy Yeung’s character, Xiao Ting? A more stereotypical romance would have given her a fatal flaw to make her character much more easily dispensable — except she isn’t; she’s the sweetest character in the whole movie. And that’s one of the things I really like about this film — there are no bad guys. Nobody is a lout. Love happens when you least expect it, but not without a few hearts getting broken in the process.